I’m still giving Violet a good workout, but she never complains and is always ready to work….Thank you Violet! I finished Satisfied With Summer and did a test ply with Poppies but it didn’t suit my taste and so will remain a single for now. I’m on the downhill side of Pretty Maids, I think I have about ten rows left to complete, bearing in mind, though, that these are long, long rows, approximately 350 stitches and increasing by two stitches each row. I’m enjoying this second go round so much more than the first, I’m sure it’s because I’m not having to constantly check the pattern and the symbol guide. It’s not flying off the needles by any stretch of the imagination, but it is moving faster this time. I finished Opium Fiend yesterday during my daily treadmill and have moved on to The Six Wives of Henry the Eighth by Alison Weir. Very interesting, up to Anne Boleyn at the moment. I’m finishing my books much slower than I’m adding them and they’re beginning to pile up, but I can’t resist a new book. I keep telling myself that I’ll get caught up in December and January, when I’ve retired and the weather is too cold and nasty to be anywhere but inside by the fire. They don’t match anything in my house – yet. Is it over the top to paint a room around the color of a couple of candlesticks from Goodwill instead of the other way around? It could totally happen. My research tells me that people who are drawn to the color violet are usually nuclear physicists or performance artists. That’s me in a nutshell. OK, maybe not the physicist part, but performance artist? Absolutely and I have embarrassing pictures to prove it. 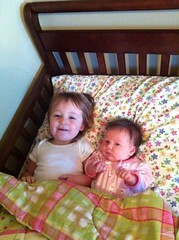 The Papoose wants Babysis to sleep in her bed with her. Bigmommy sent me this yesterday. Is this not the sweetest thing?